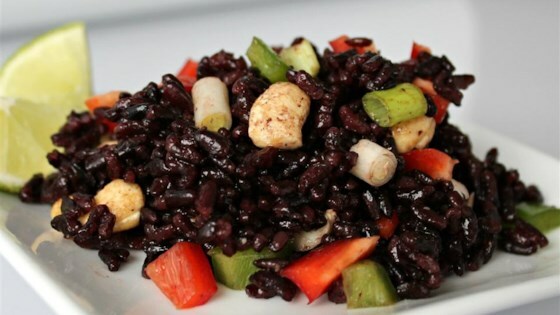 "A spicy blend of forbidden black rice, bell peppers and cashews. Serve hot or at room temperature." Combine water, black rice, and salt together in a saucepan. Bring to a boil; reduce heat to low, cover, and simmer until rice is tender, 30 to 45 minutes. Whisk soy sauce, sesame oil, lime juice, and sriracha sauce together in a large bowl. Add cashews, red bell pepper, yellow bell peppers, and scallions; toss well to combine. Add black rice; stir until salad is well-mixed. Season with salt, black pepper, and sriracha.